“Fight for $15” and “Unionize” resonated in 300 cities around the U.S., chanted by workers marching on Sept. 4, Labor Day. 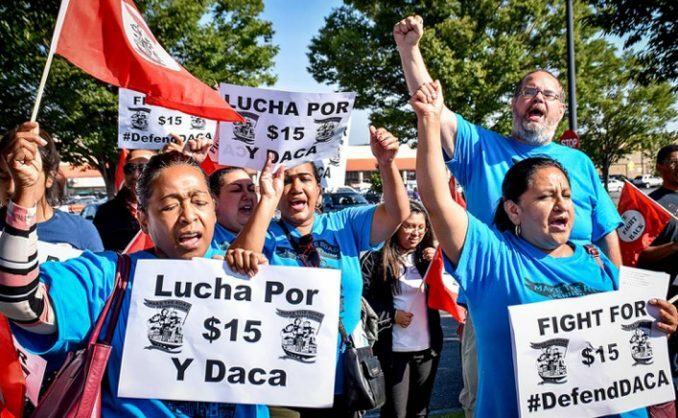 Thousands of low-paid fast food and other workers, many of them African American, Latinx and immigrants, demanded a $15 hourly minimum wage so they could better care for their families. McDonald’s workers struck in several cities, joined by union members and other allies; they called for not only better pay and working conditions, but the right to organize unions to defend their rights. In Philadelphia, Fight for $15 PA, Service Employees Union 32BJ and other unions representing fast food, home care, airport and retail workers and immigrants, joined by community activists, rallied and marched around a South Philadelphia McDonald’s restaurant. They demanded a raise in the minimum wage to $15 an hour from Pennsylvania’s $7.25 hourly wage. A contingent of immigrant workers energized the rally with chants of “Lucha por $15 y DACA” (“Struggle for $15 and DACA”); their signs had the same slogan.